Yesterday, I went to see Kooza, the Cirque du Soleil show that was playing in Baltimore, and I am hooked. I found myself sitting, eyes wide, mouth hanging open as human beings in bodies like mine (more or less, okay, mostly less, but still . . . ) doing these phenomenal things. I was stunned by the cortortionists who folded themselves basically in thirds and then stood on one another. As Kathy said, “where do their internal organs go?” Then, the high wire walkers wowed me, as did the man who could balance on a set of chairs 20 feet in the air. But I was absolutely stunned and awed by the two guys on the Wheel of Death. In case you haven’t seen the Cirque, the Wheel of Death is a giant metal contraption with two metal wheels, kind of like hamster wheels, on each end. One man gets in each wheel, and the whole thing spins – fast – so they have to walk or run to keep up with it. As the wheel turns, the men jump and leap and spin and free fall; that alone took my breath away. But then one man got on the OUTSIDE of the wheel and did the same things. But then he also jumped rope – almost falling at one point, and then he started doing flips and leaps. I just couldn’t get over these guys. Wow. The clowns were amazing, too. 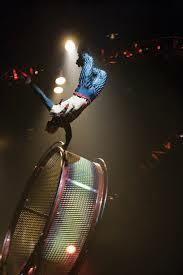 This is one of Cirque’s shows that uses a lot of clowning, and these guys were really funny. They pulled up audience members and pickpocketed them or made them disappear only to reappear several minutes later at a different point on the stage. They hammed it up, and I really appreciated the humor after all the fear that the acts produce. The show got me thinking about how these people must train. Part of the program said that the trapeze artist had been with the circus since she was six, and the part of me that wonders about child celebrities’ mental health began to wonder if it’s a good idea for children to be this intensely interested in one thing. I’m still noodling that idea over, but I’m also thinking about why we don’t want people to be devoted to something amazing like this. What do we, as a society, fear will happen if people are really good at one thing? Is it what Kathy mentioned – that a person will do something they love and then come to hate it? I suppose that’s possible, but then it’s also possible that a person will find something they love and keep loving it. I see so many people in jobs that are mediocre, jobs they tolerate or even loathe, and I wonder what their passion is. What could make them so alive that they would dedicate their lives to it? I’ve found that thing for myself – writing and this dream of my farm. There’s nothing I want more, and yes, I’m sure I will tire of it some days, but when I write and live into my dreams, I am more myself and more content. I don’t feel the need to strive; I just do what I am made to do. That’s what I saw in the Cirque du Soleil performers – people living into something they’re passionate about and made to do. I’m sure it’s not as idyllic behind the scenes as it appears on stage, but still, I walked away in wonder about the capacity of life – what would the world look like if we all poured ourselves in our passion? What if life looked like Cirque du Soleil? So in that sense, I am running away with the circus (I even bought a button and journal to remind myself of that). I am running away into life itself. Just like “The Kid” in the David Wilcox song, “I can no more stop dreaming than I can make them all come true.” But I”m going to try.